Landrace Cottage offers self catering accommodation in Carlton Miniott near Thirsk, North Yorkshire. It is ideally situated for exploring the Yorkshire Moors and Dales, as well as the north east coastline. 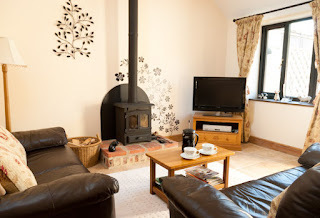 This cottage can sleep up to 4 people and has been decorated and furnished to a high standard. The living space is open plan with comfortable leather sofas, coffee table, flat screen Freeview TV, DVD player, CD/radio player and an oak dining table with chairs.There is a wood burning stove in the living area for those cooler evenings. All fuel and logs are included in the rental price. 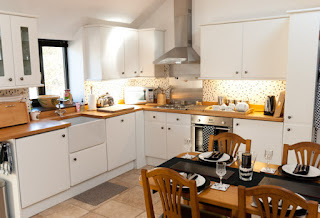 The fully equipped kitchen has solid beech work tops and a Belfast sink. Cupboards are filled with all the crockery, pans and dishes you will need. There is 1 double bedroom with en suite shower room & 1 twin bedroom. Outside is a large, private gravelled sitting/garden area with open views to the paddock and fields beyond. A set of table and chairs, parasol and barbeque are available for al fresco dining. The cottage is just two miles from the charming, traditional market town of Thirsk which is well worth a visit. Outdoor markets are still held in Thirsk on Monday and Saturday. North Yorkshire is home to beautiful countryside and both the Yorkshire Moors and Yorkshire Dales are within comfortable driving distance.